1 of 3 Heat oven to 350 degrees . In a bowl, whisk together flour, cocoa, baking powder, baking soda and salt. In another bowl, beat butter, granulated sugar and brown sugar for 2 minutes, until fluffy. Beat in egg and vanilla extract until just combined. Pour in flour mixture and beat on low until just combined. Carefully fold in chocolate chips and chopped pretzels. 2 of 3 Drop tablespoonfuls of batter on baking sheets, spacing them about 2 inches apart. Press down lightly to flatten. 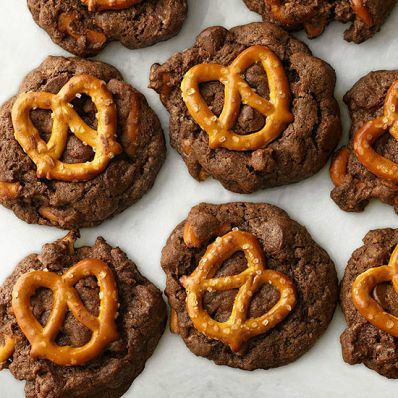 Gently press a whole pretzel on top of each cookie. 3 of 3 Bake at 350 degrees for 11 minutes. Transfer to a wire rack to cool completely.